Something in our gardens that are now at their showiest best are Clivias. Bernard Chapman is a consulting horticulturist and manages many large heritage gardens on Sydney's North Shore. He has written an article about them in the latest GardenDrum blog post. Unlike Bernard, I don't really have a favourite child (although it has to be said that perhaps there are some that I get on better with, but undoubtedly love them all equally!). 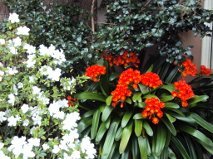 However, Clivias are always a delight to see in any garden, the above image was taken at Toowoomba and as I'm not a very good photographer it actually looked much better than this. It seemed to just glow..... so beautiful. Clivias are such tolerant plants - they will divide very easily (if you can prise them from their pots - usually the pots have to be smashed if they have a narrower opening) and are also easy to grow from seed - given enough time. They will take a few years to actually flower this way but fun, nonetheless. 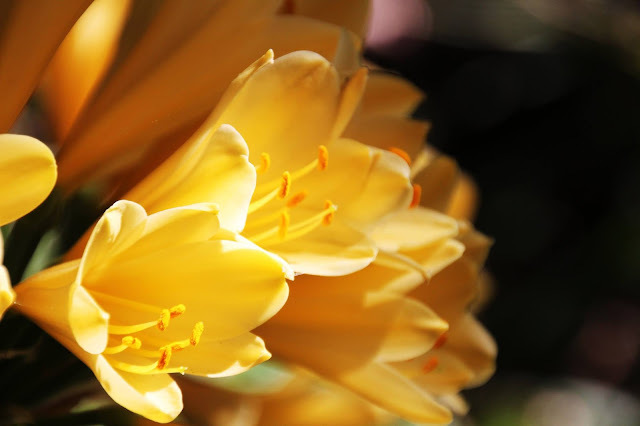 To read more about Clivias just visit this GardenDrum article. You will see how to grow them successfully, propagate them and common pests and diseases. There are some good images too - better than mine!